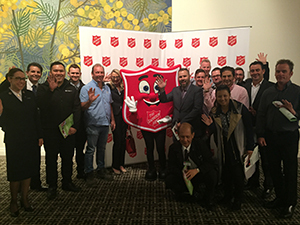 The Southern Star Group is delighted to have helped launch the Salvation Army’s trademark Red Shield Appeal for 2016 last week. The event took place at the Sofitel on Collins and saw a gathering of supporters from many community businesses that share a passion for the organisations goals. The Red Shield Appeal is The Salvation Army's signature fundraising drive which helps fund the vast network of social and community services. The appeal is run over the months of April, May and June each year with the Red Shield Doorknock being held on the last weekend in May. Thousands of volunteers will travel from door to door, collecting donations; with various collection points such as shopping centres and sporting grounds also set up throughout the month of May. Each year The Salvation Army appeals to the Australian community to ensure they can provide hope to those in need through social welfare and community service programs. Many Australians rely upon these programs every single day. Ranging from providing shelter to the homeless, assisting families in crises through practical support and financial counselling, or guiding people with addictions through to a clean, healthy lifestyle. Thanks to these efforts, the Salvation Army helps more than 1 million Australians every year. We would like to also extend a special thank you to AV Jennings, Edgepoint Homes, Henley Property Group, Fairhaven Homes, Fynnan Construction Group and Housespcec for joining us in the launch.